In case you're one of the unlucky many in the dark (actually, this should read about 99.999% of the global population if my calculations are correct) and/or you don't happen to cotton on to the name straight off the bat, Super Jetter is the story of a 30th century crime-fighter who jetted about in a time-skipping vessel called Ryusei-go (Shooting Star). 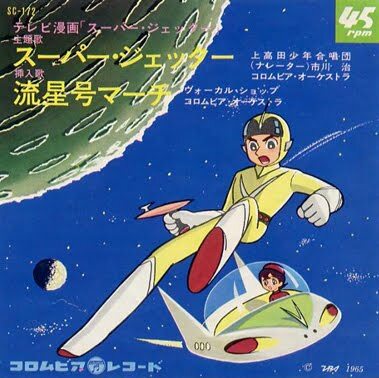 It played along the same lines – while it's been somewhat overshadowed by - contemporary 1960s anime peer Prince Planet, aka Planet Boy Popi (遊星少年パピイ) over here in Japan. You can't even begin to compare it with Osamu Tezuka's iconic Astro Boy. But I really do dig this series and it was commemorated in Japan just a few years back with the release of the CR Super Jetter pachinko machine; there are also some wayward otaku aficionados over here who do remember the man and his spiffy flying car. One of these is Osamu Kobayashi. He was the director of the anime fashionista series Paradise Kiss for Madhouse Studios and previously directed Gad Guard, Beck: Mongolian Chop Squad and End of the World; more recently he was a guest director on Gurren Lagann - and way back worked on the 1993 anime reinterpretation of Yukito Kishiro’s manga Gunnm... better known internationally as Battle Angel Alita, the on-again/off-again live-action love project for director James Cameron. Super Jetter, according to Kobayashi, was his favourite anime when he was a kid, and the reason for his own abiding affection for the 45-year-old show? “Because I liked the central character, and the science fiction mind-set was interesting,” he quite simply declares. It's the simplicity that works for Super Jetter as well. 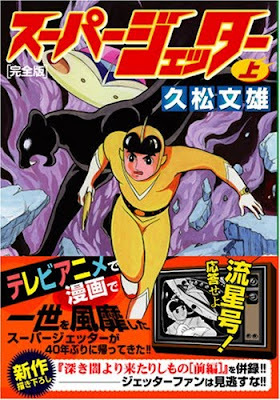 Sadly Osamu Ichikawa, the man who did the voice of Jetter, passed away just last year.